Happy Easter! We are now CLOSED for Easter - Please order your Delivery for Tuesday 23rd. Thank you I am very pleased with the orchid arrangement, and my daughter who they were sent to in Auckland was thrilled. The Perfect Get Well Gift Package! 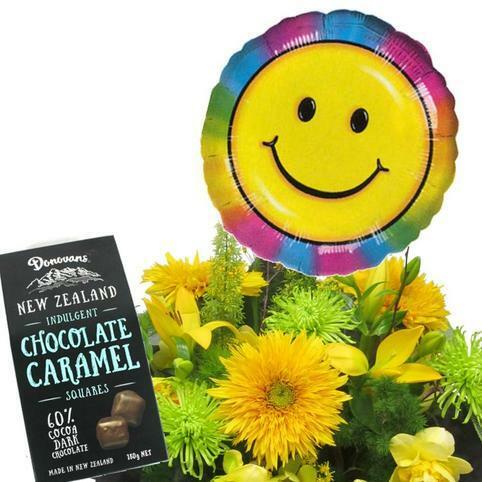 A lovely bouquet of flowers in a water-filled vox, with a floating Helium Get Well Soon Balloon and a delicious box of Donovan's Chocolate Caramels. 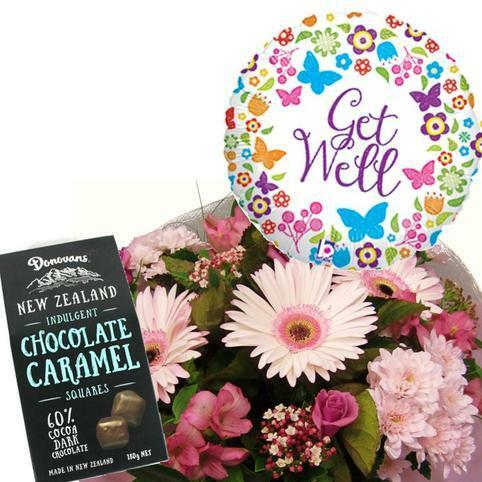 We have a wide choice of Get Well balloons available and will choose the perfect balloon to match your flowers. YES - we can do ave a Smiley Face Balloons, Feel Better, Speedy Recovery Balloons and we also have a wide choice of Kids Character balloons. Your flower bouquet can be done in any colour combination - Please advise if you have a preference in the "Notes to Florist" section of your order. Add a pretty keepsake butterfly to your flowers. Something to delight the recipient, as it continues to remind them of your thoughtfulness. We will colour match the butterfly to your flowers. Add more than one, to make your gift even more charming. Cute as a button this little brown bear will cheer them up with its Get Well Soon Ribbon and Bow. 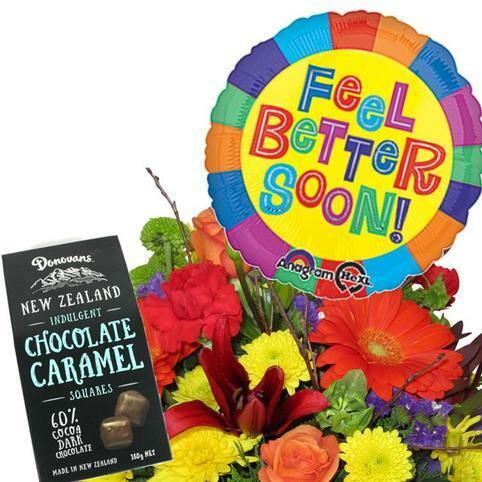 Perfect to add on to a get well gift. 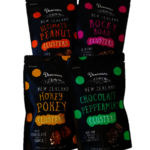 Scrumptious chocolate-coated clusters, made in New Zealand by Donovans - a tasty addition to your thoughtful gift. 150g. There are more choices for Add-on Gifts & Extras following the 'Buy Now' below. 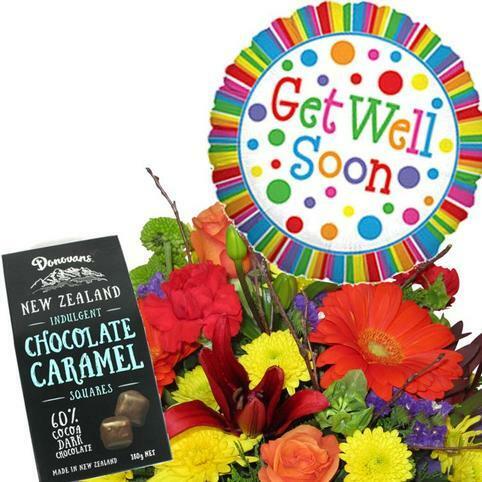 Our Flower and Gifts include FREE Delivery to ALL Auckland Metro Suburbs. Except for outer deliveries which incur a rural $15. < HANDY HINT: Click in the Select your Delivery field then type the letter your suburb starts with. Click on the suburb your delivery is going to and it will calculate any rural delivery charges. > Order by 10.15am for guaranteed Business delivery today. > Order by 2.15pm for same day delivery to a home address or hospital today. > Order by 9.30am for delivery Saturday. > No Sunday delivery service sorry. Yes - You can order flowers ahead for next day delivery or for any future date. Our flower shop is located in West Auckland, so we are able to accept your order for West Auckland later than these times, subject to courier availability. Please do call us to check on + 64 9 838 9058. I Promise - If you or your recipient aren't thrilled, simply contact me and I will honour our Guarantee. I want you both to be delighted! Choose between 3 sizes to fit your perfect size and budget. We buy fresh and in season from local growers and flower markets constantly. All our Bouquets are delivered in water and Flower Food at no extra cost to you. We put the customer as priority and provide excellent, timely communications. The proof comes with over 40,000 satisfied customers, and counting. TOP SHOP Winner - Best Gift Shop in Auckland. Our Florists are trained to N.Z. Professional Florist standards and our training is ongoing to continually improve ourselves. Yes we send flowers Auckland wide.